The U.S. 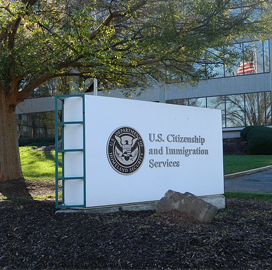 Citizenship and Immigration Services plans to open bidding to current IT Schedule 70 contract holders for a $100M contract to help the agency modernize its information sharing system, Nextgov reported Tuesday. USCIS announced the Enterprise Gateway and Integration Services contract in a presolicitation notice posted on the Department of Homeland Security's acquisition forecast portal. The EGIS vehicle will replace the third generation of the Business Enterprise Service Technologies contract and will focus on the modernization of USCIS’ enterprise service bus infrastructure, on the upgrade and maintenance of its legacy systems and on the development of a new electronic case processing system for the agency. The USCIS said it aims to release the final request for proposals for the contract on Feb. 8 and to name awardees in the third quarter of the current fiscal year.